way his product was progressing. He decided to contact a local forester to learn what was eating his trees and why they looked so unruly. Shortly thereafter, he and Helen got pretty good at diagnosing and controlling the myriad of pests, weeds, fungus and other tree ailments. They also perfected the art of shearing . In 1963 they rented a small lot in a local town (Mountaintop,PA) and sold their first trees. It was tough at the lot with limited resources and comforts, so the next year Helen suggested they advertise “Helen and Ed’s Tree Farm” where customers could choose and cut their own trees right at the farm. It was a success and a profitable business was born. Over the years many changes were implemented to provide a wide range of tree choices and provide services to make the tree buying experience fun, memorable and worthy of a yearly tradition. In the mid 60s Ed Jr. was born …that’s me. 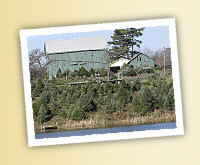 I grew up on the farm and learned many of the aspects of the tree business. I attended Penn State University where I advanced my education in Agriculture with a BS degree in Environmental Resource Management, while still shearing and taking care of the trees during the summer months. While at Penn State, I met a beautiful girl named Elizabeth who graduated with a BS in Marketing. We eventually married and had two sons, Dylan and Jeremy. (Third generation?) After eight years of working for an Environmental Consulting firm, running the farm, building a house, raising children and adding 80 acres, it was time to focus my attention to something I did my whole life. Trees: So in 1996 with the help and encouragement of my parents who thought they were ready to retire, I quit my “real” job, acquired the farm and began planting and digging trees for the landscape market while still planting many new varieties of evergreens for the choose and cut market. I think the reason Helen and Ed’s has been a success is because they chose to do something that they were really passionate about. Ed and Helen are still doing well and are involved in daily operations on a limited basis. Retirement… never.